For remodeling a kitchen, adding tile to fireplaces, revamping the tile in your bathroom or any other tiling redesign, TileSizer is a must! TileSizer is a unique tile cutting tool that allows you to precisely and accurately cut your tiles in a variety of styles without risking harm to your fingers. 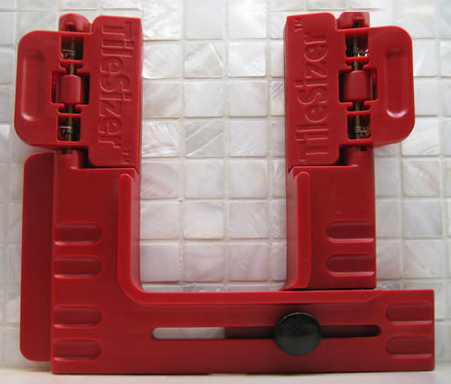 TileSizer will hold your tiles tightly while cutting with a wet saw. Best of all, TileSizer allows you to secure smaller tiles for easy maneuverability so you can achieved a professional quality cut. Unlike other tools (like tile nippers), TileSizer minimizes breakage that often occurs when cutting tile and holds on to both sides of the tile strongly during the tile cutting process. Get the incredible tile saw tool and get going on your home DIY projects! Available at tilesizer.com for just $29.99! © Tile Sizer. Simple theme. Powered by Blogger.